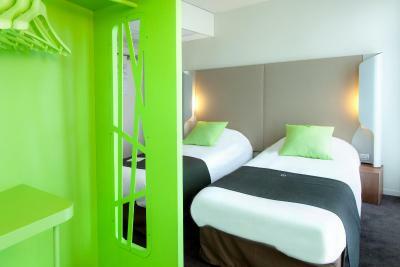 Lock in a great price for Campanile Rennes Sud - Saint Jacques – rated 8.2 by recent guests! Breakfast was very good. People were nice and helpful. The rooms were clean and the place quiet. It is close to the airport. Nothing, I would never stop here again and to be honest I will likely avoid this chain after this appalling experience. The comfort of the room. The layout was not fussy. Great colour of room. Bed very comfy. Everything was comfortable and relaxing while on a complicated travel programme. Location close to airport. The only reason to choose this hotel. Taxi to airport is €15,- for a 5 min drive. Great location to reach the airport, cosy parking, and friendly staff. We asked a couple of information regarding places where to eat crepes, and the staff was spot on in suggesting a place. The rooms are right size and super clean. The room was super comfy and very well appointed. The bed was lovely and very comfortable and the bathroom was clean and very new. Everything worked well. This is a basic hotel which is convenient for the airport. As such it lives up to expectations. 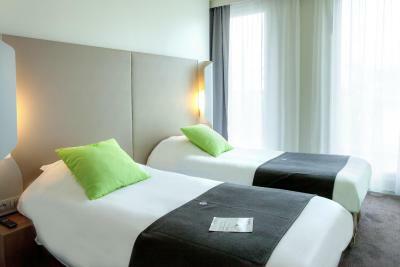 It is not a luxury hotel but it does not charge a luxury price. The room was a reasonable size and had everything you want conveniently arranged. Easy to find and good stopover. Functional but check your room especially is the aircon. working. Our room good but the other not. 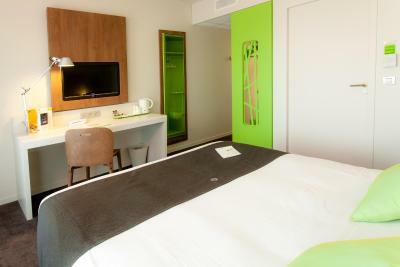 On the outskirts of Rennes, 3.3 mi from the train station and a 9-minute drive from the airport, Campanile Rennes Sud - Saint Jacques has a bar with a lounge, 24-hour reception, and free Wi-Fi throughout. 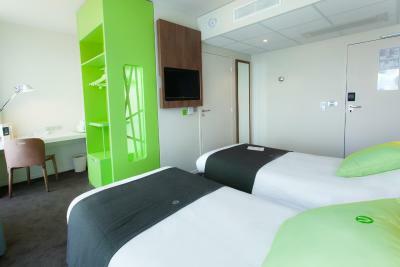 The rooms at Campanile Rennes Sud - Saint Jacques feature a flat-screen TV with Canal+ and BeinSport channels. 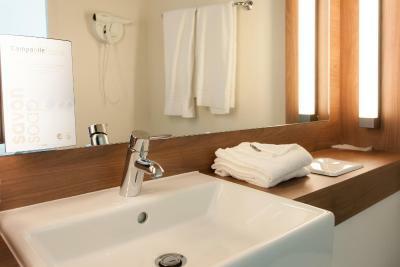 The private bathrooms include a bath or shower and a hairdryer. A buffet breakfast is available daily and charges are applicable. Board games are available in the hotel's shared lounge. At a reduced rate, guests staying at Campanile Rennes Sud - Saint Jacques may have access to a fitness center, located right next to the hotel. The property is 2.2 mi from Parc Expo Rennes and 2.8 mi from Roazhon Park. Free on-site parking is available. 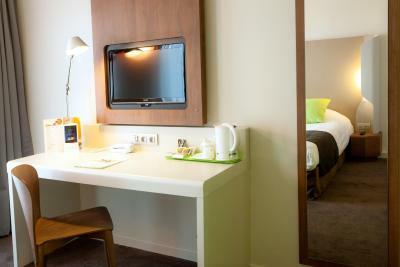 When would you like to stay at Campanile Rennes Sud - Saint Jacques? 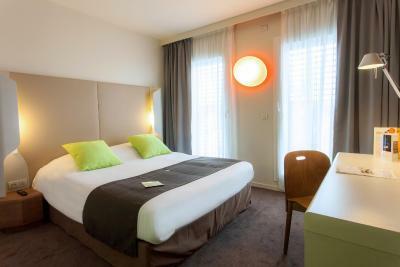 This double room features a flat-screen TV with cable channels, air-conditioning and individual heating. 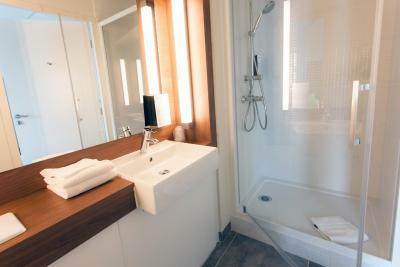 The private bathroom includes a bath or shower and a hairdryer. 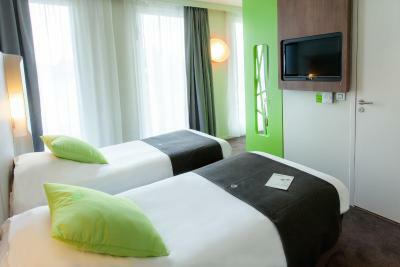 This twin room features a flat-screen TV with cable channels, air-conditioning and individual heating. 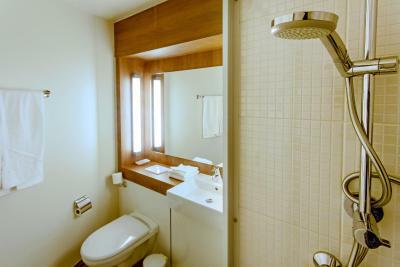 The private bathroom includes a bath or shower and a hairdryer. 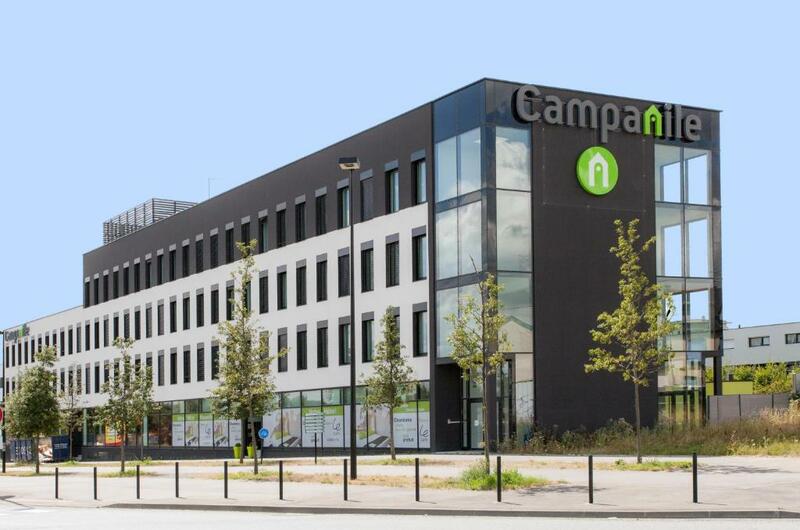 House Rules Campanile Rennes Sud - Saint Jacques takes special requests – add in the next step! Campanile Rennes Sud - Saint Jacques accepts these cards and reserves the right to temporarily hold an amount prior to arrival. Please note that for long stays (5 nights and more) the property will charge a 50% of the first night non refundable prepayment. Everything! First room was filthy, second room was barely an improvement. Charged my card twice so have to wait 7 days for refund. The staff were awful, so unhelpful. Very late at night and kept us waiting to check in whilst they did paperwork. All is been wary good! Not so much didn't like but when we got to the hotel after an 18 hour flight we really needed to unwind. Was told by receptionist that it was not a 24hr bar. We did read that it was but only the next morning. Also rang from Paris Charles de gaulle airport to confirm we would be after 11 and the receptionist did not grasp what I was saying. Perhaps I didn't explain myself well enough. Comfy and clean. Breakfast nice selection. Noise from gym nextdoor could be heard in my room (dropping weights) I was on the 3rd floor! Diner and breakfast were mediocre. Taxi to airport is €15,- for a 5 min drive. The location. I travel back with the family car on my own whilst my family fly. I arrived at the hotel at about 5pm but there was nowhere to eat without either eating at the hotel or getting a taxi. The nearby restaurant is a cafe / bar and only serves pizzas - although very good, they don't open for hot food beyond 5.30pm. Difficult to find. On a busy road. Busy area. 1. Very slow wifi, download speed test 4,4MB, 2. We booked the room without breakfast. When we checked in, the reception told us free breakfast is included. So we were very surprised to hear that and we asked again, the she confirmed again. Then 30 mintues later we came back and ask the same lady same question, she said the breakfast is not included.... 3. Room 317 bathroom is facing to the parking and the window shelter can not be completely closed so when we were in the light bathroom, there could be a chance that dark outside can see through the window shelter.